A ring of thieves illegally took ownership of more than 40 homes across South Florida in a multimillion-dollar plan — even stealing properties that belonged to the dead, authorities say. Group members used fraudulent notary signatures to get the properties, then they lived in the homes, sold them or rented them, arrest reports said. The ring, which operated under various company names, is facing more than 600 felony charges that include grand theft and identity theft. It allegedly used quit-claim deeds and powers of attorney to take ownership of the homes. All told, the homes were worth nearly $12 million. They were concentrated in west Broward County, in cities such as Coral Springs, Tamarac, Lauderhill, Parkland and Weston. The Sheriff’s Office investigation is the latest South Florida case where investigators say homes were illegally taken without owners’ consent. Squatting in foreclosed homes reached a fever pitch in the earlier part of this decade. Many homes were left empty because banks couldn’t keep up with the foreclosure proceedings after many homeowners found themselves owing more on homes than the homes were worth. Seven people are accused of stealing 44 homes worth nearly $12 million. In 2013, one case in Boca Raton made worldwide headlines when Andre “Loki Boy” Barbosa, then 23, squatted in style at a 7,200-square-foot home valued at $2.5 million, on the Intracoastal Waterway. No one saw him break into the opulent home, so it became a civil matter because of an archaic law. That law was stricken from the books during the next legislative season. 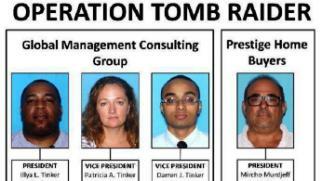 This month, as part of “Operation Tomb Raider,” authorities arrested six of seven suspects Tuesday. The seventh, Compton Maycock-Beckles, 44, was found squatting in a foreclosed Weston home in 2016, according to the Sheriff’s Office. He is facing grand theft and fraud charges. The case began when sheriff’s Detective Christopher Bradley found Maycock-Beckles living in a foreclosed home that belonged to someone else, officials said. The original owner said he never gave Maycock-Beckles or his employer, Global Management Consulting Group, permission to live in or sell the house. The detective found notaries who had their notary stamps and signatures stolen to authorize deeds and property transfers without their knowledge, the Sheriff’s Office said. Members of the ring sometimes sold the same home to more than one person and collected payments from both buyers almost simultaneously, authorities said. In other cases, they used powers of attorney to get access to dead homeowners' bank accounts and Social Security checks, then back-dated documents to make it look as if victims had given their permission, detectives said. Adriana Wulff, 49, of Kendall, was shocked to learn she was one of the victims named in court papers. She had been led to believe that a Weston home she left in 2007, while she was divorcing, was in foreclosure, she said. The Weston home isn’t the one Maycock-Beckles allegedly was found in. The arrest report says the home, now valued at $518,000, was in foreclosure, but a fake deed made it look like Global Management Consulting Group owned it and then sold it to another company, Prestige Home Buyers LLC, which was in on the fraudulent activity. The other suspects charged in the group are Catherine Lichtman, 56; Mircho Murdjeff, 58; Gillian Solomon, 49; as well as Illya Livingstone Tinker, 48; wife, Patricia, 44, and son, Darren, 23. WTVJ-Ch.6 went along for the ride with the Broward Sheriff’s Office on Tuesday morning as the arrests were made. “It’s not true, sir,” a handcuffed Illya Tinker told a reporter during the arrest at his Lauderhill home. 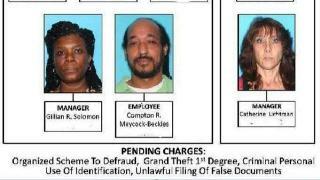 Gary Singer, a real estate lawyer in Fort Lauderale who writes a column for the South Florida Sun Sentinel, says this alleged theft ring appeared far more sophisticated than other defendants from cases from years ago. Singer said he is representing a relative of one of the dead people whose home in Margate was illegally acquired through a fake quit-claim deed. There were clues throughout the documents that the transaction was not entirely legitimate, said Singer, who is cooperating with police in the investigation. The deed, for example, showed a sale date two years before it was actually recorded. The notary whose signature is recorded there said she did not sign it. Arrest reports don’t say what happened to each of the victims whose homes were taken, or to those who rented properties from the ring. The home involved in Singer’s case is currently occupied by a renter who is going to be removed, he said. “They might be victims as well, but that doesn’t mean they get to live there,” he said. The Broward Sheriff’s Office asks anyone who thinks they may have been victimized or has information about the case to contact the agency at 954-888-5319. Tips can also be made, anonymously, to Broward Crime Stoppers at 954-493-8477 or online at browardcrimestoppers.org.